Global Underground Mining Diamond Drilling Market – Industry Analysis and Forecast (2018-2026) – by Type, Application and Region. Home » Reports » Mining And Metals » Global Underground Mining Diamond Drilling Market – Industry Analysis and Forecast (2018-2026) – by Type, Application and Region. 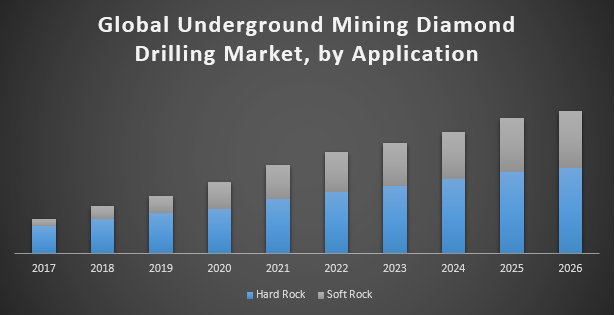 Global Underground Mining Diamond Drilling Market was value US$ 415.0Mn in 2017 and is expected to reach US$ 690.0Mn by 2026 at a CAGR of 6.56 %. The objective of the report is to present a comprehensive assessment of the market and contains thoughtful insights, facts, historical data, industry-validated market data and projections with a suitable set of assumptions and methodology. The report also helps in understanding global underground mining diamond drilling market dynamics, structure by identifying and analyzing the market segments and project the global market size. Further, the report also focuses on the competitive analysis of key players by product, price, financial position, product portfolio, growth strategies, and regional presence. The report also provides PEST analysis, PORTER’s analysis, SWOT analysis to address questions of shareholders to prioritizing the efforts and investment in the near future to the emerging segment in the global underground mining diamond drilling market. Underground mining diamond drilling includes of diamond core drill bits, which are equipped with drilling systems, for example, rotary or wireline drilling systems. Deployment of efficient coring drilling rings in the exploration phase entails extensive capital investment. Mining companies invest significantly in installation and testing of mined samples over coring systems. Growing the demand for base metals such as nickel, lead, copper, and zinc and precious metals for instance gold, silver, and diamond is expected to boost investments in the metal mining business. This is possible to augment the demand for diamond core drill bits that are used in underground mining of hard rocks. Diamond core drill bits are mostly employed in the exploration industry, especially for hard rocks, as the penetration of diamond bits is high regarding that of other materials. In 2018, Halliburton Company released Cerebro in-bit sensor package, a new and advance technology that obtains performance data directly from the drill bit and analyses it to optimize cutter engagement, reduce uncertainty, and rise in drilling efficiency. Wire line drilling segment is dominating the global underground mining diamond drilling market. The order intake for underground mining diamond drilling equipment, for instance, wire line drilling has increased across the globe owing to the constant demand for these drilling solutions among underground mine operators. Region-wise, North America was the largest revenue-generating region in the underground mining diamond drilling market in 2017 and is anticipated to continue its dominance in the market by 2026. In North America, US dominated the underground mining diamond drilling market. Some players in North America supply core drill bits along with complete drill rigs solutions. These include Peak Drilling Ltd., SCS Diamond Drilling, and American Diamond Tool. The market in Canada is anticipated to expand at a rapid pace in the upcoming future. Star-Orion South Diamond Project pilot hole core drilling was completed in 2017. Latin America is the important region of the global underground mining diamond drilling market. Increasing investments in the extraction of underground minerals is expected to augment the demand for hard rock mining in Latin America. Countries in Latin America are start to shift to underground mining from open-pit mining. South Africa was the moderate revenue-generating region in the underground mining diamond drilling market in 2017. Relative to global averages, exploration spending in South Africa is more focused on gold, diamonds and PGMs than on base metals and industrial minerals. Geographically, over 50% of South African non-ferrous exploration spending is focused in South Africa, DRC, Burkina Faso, Ghana and Zambia.